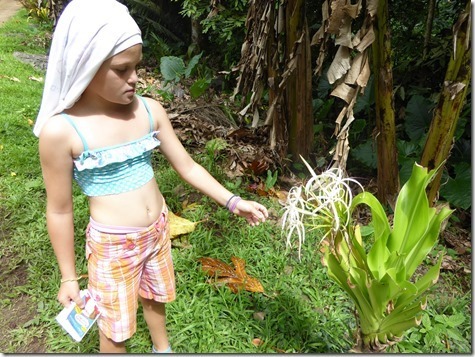 A continuation of the blog post for our second visit to Hiva Oa. 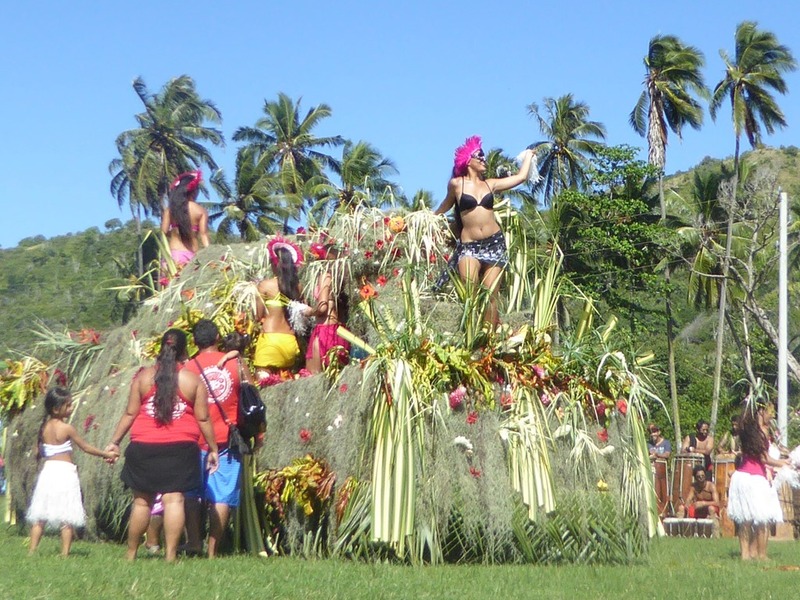 The site of Me’ae Iipona itself is small in comparison to the larger festival sites we visited in Nuka Hiva but it had a completely different role. It was the holy of holy places, where only the high priests, chieftains and heroes would be allowed to go. It was where the sacrificial alter was as well. 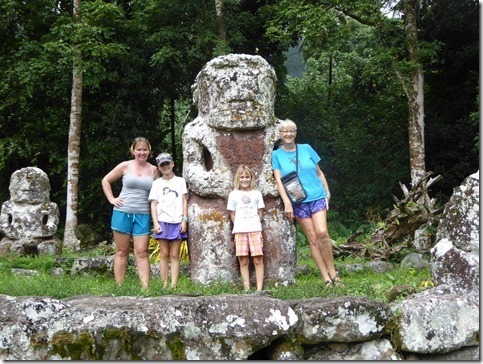 The main tiki is the largest in the whole of French Polynesia, standing well over 2m high. It is the only place where we have seen a tiki dog, set to guard over the site. 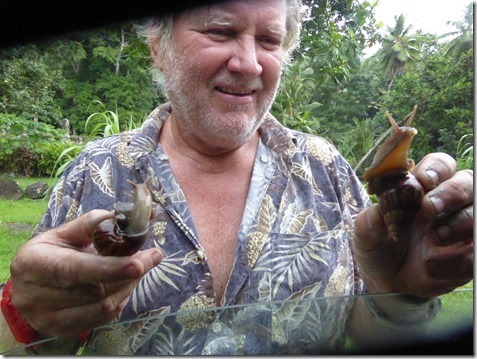 John then freaked the girls out when he returned from a wander with two enormous snails. There were screams! On our route back, we spotted a huge tiki in a back yard which was obviously being made. We stopped and a man came out, smiled and asked us in to get a better view. We found ourselves in his workshop where he was in the process of making a 3’ tall wooden tiki like the one in the photo. 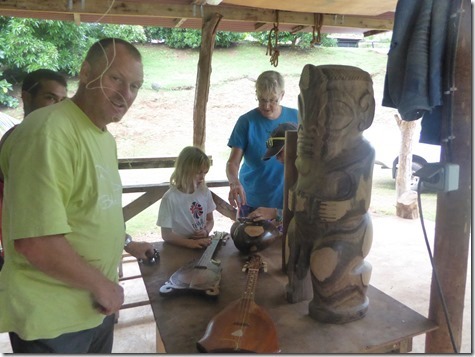 He also had a few beautiful instruments, 8 string ukuleles, which were in the last of the polishing processes. We asked prices but at $500 a dollar a pop they were a bit out of our price range. 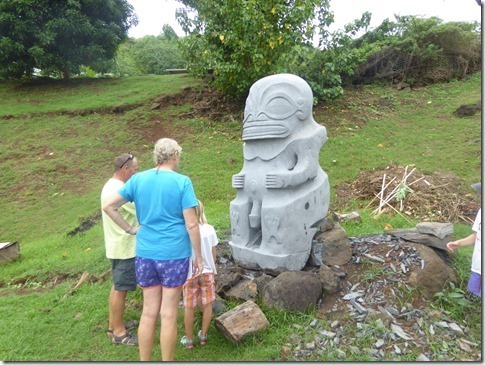 The stone tiki is being done on commission for the island Town Hall. 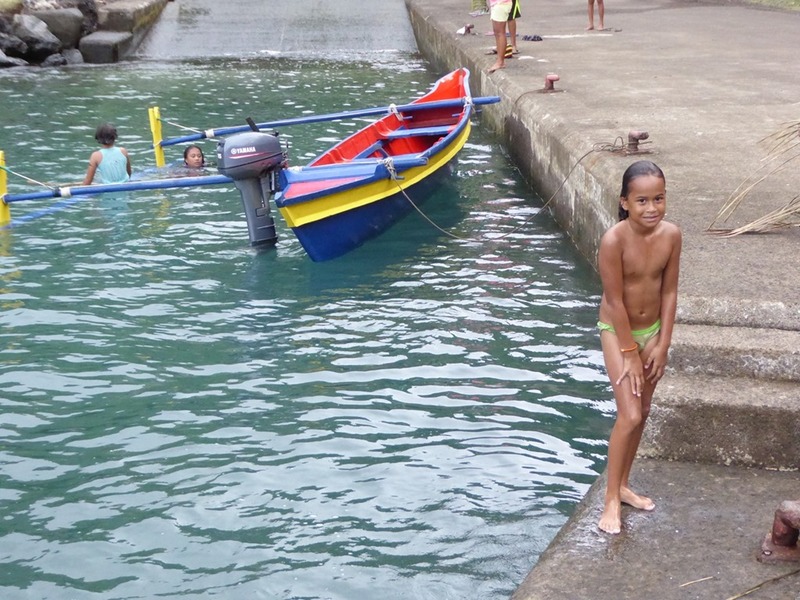 Having driven right to the end of the road (incidentally finding a couple of wild pomolo trees and loading up with fruit), we turned back and made our way to the village of Hanaapa which has the best anchorage on the N side of the island. 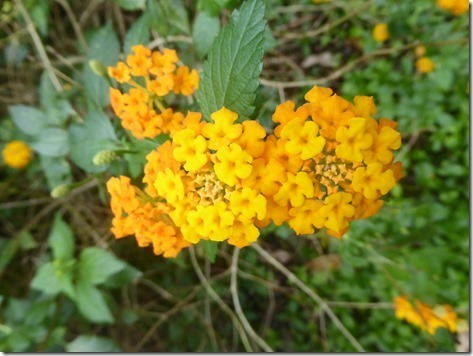 There was little there other than a few beautifully maintained houses, with gardens so colourful. 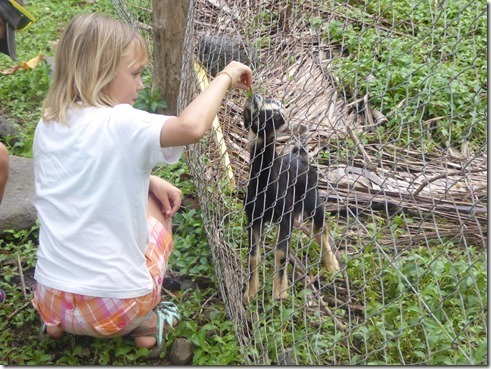 Hannah was satisfied when she found a baby goat and spent most of her time feeding it through the wire fence. 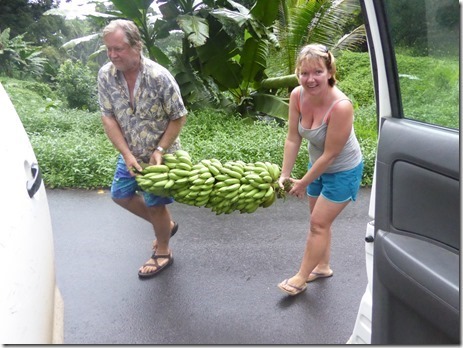 We had one more stroke of luck when we found another roadside banana tree in rough land. John and Lou liberated its load and we halved them between us. 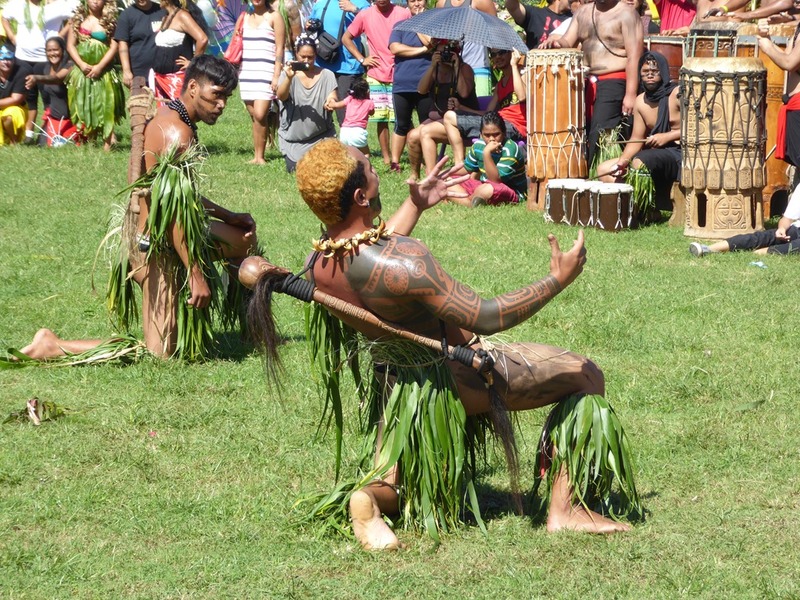 Our last couple of days at Atuana were busy. 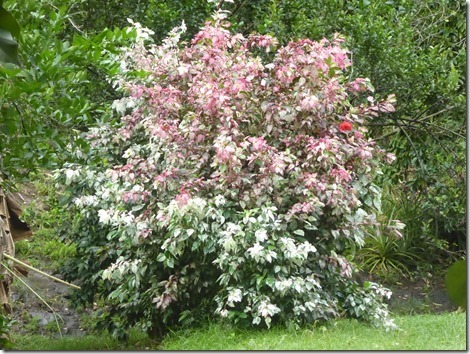 We managed to book our New Zealand flights for 12 Nov with a return on 23 Feb to Apataki. 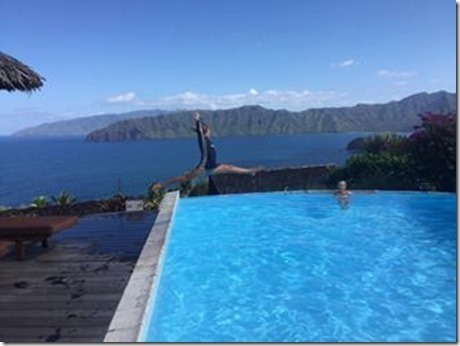 Lou, Julia and the kids made good use of the local luxury hotel with swimming pool as a special treat to do this. Not so bad a view too. Thoroughly recommended. They do two deals for cruisers. 1. $10 entry, buy drinks and stay the day with free internet and pool. 2. $35 entry, choice of main courses for lunch, free pool and internet. Kids are $20 ahead. E and H both got adult mains (no kid’s portions here) which were priced at more than the entry fee so a good deal for them. E’s eyes were out on stalks when she saw the size of her steak. We also met up with a great crowd of Irish on their rather large Oyster 66 called Elvis Magic, newly arrived from the Galapagos. The kids made a new friend, a wee lad called Jonny, who, being the only kid on the boat and having not seen another child for a three weeks, was as desperate as our two to play. They were a really nice bunch but sadly in a rush to get to Bora Bora in a couple of weeks time. 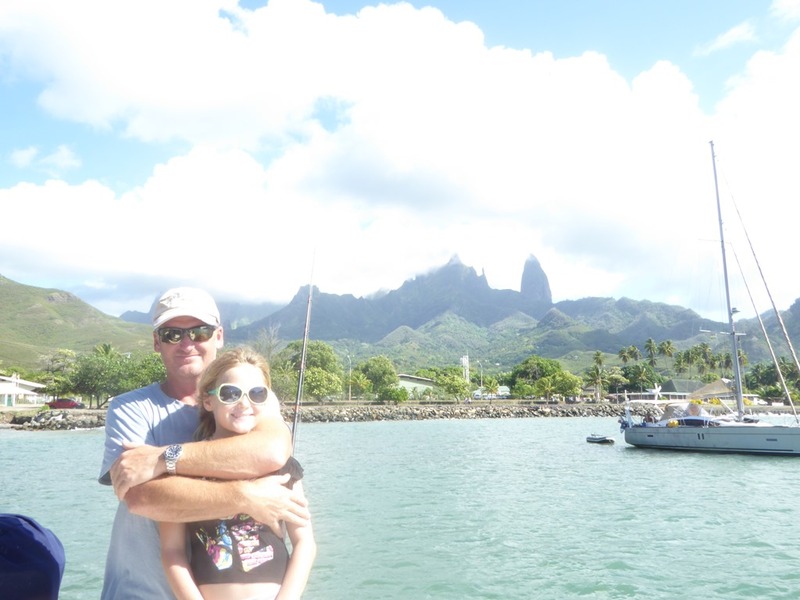 Having restocked, refueled and said our goodbyes to a number of people we had made friends with in the bay whilst we had been hauled out over a month before, we headed out and SE towards Faku Hiva, the last island we plan to visit in the group before we jump to the Toamotus. We look forward to catching up with Sid, our French ex copper, who helped recover some of our photos on the broken computer, on route to work in Vanuatu in a years time. 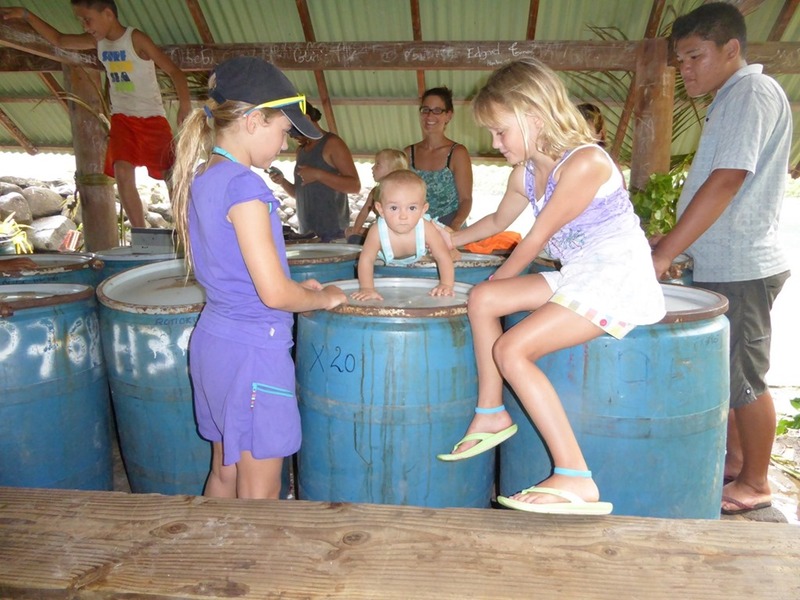 We have enjoyed Hiva Oa on both our visits. The second time around, not having to deal with fixing Skylark was less stressful and more fun. Exploring the island by land was well worth doing and we got to see the amazing diversity of the island. With good and friendly locals, some expat French and a small (nearly) permanent boating community, it is an interesting mix of cultures – all getting along. 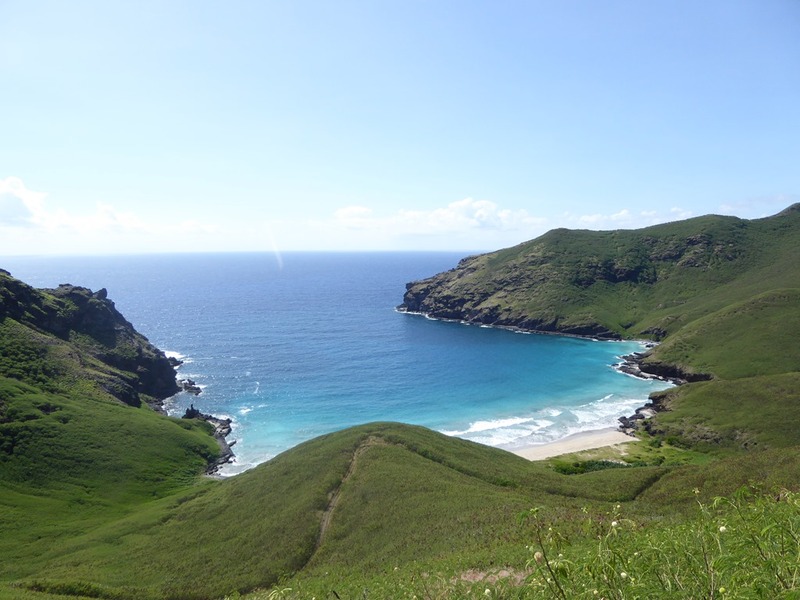 All this place is missing is a beach on the S side of the island but then we did have Hanamoenoa Bay just 5 miles away when we needed it! On the basis that our next island group, the Tuamotus, are about as remote as you can be in the world and the shopping is near non existent, we have headed back to Hiva Oa to load up. We also need to have decent internet to do some catching up on blog posts, book flights and research vehicles for New Zealand. We timed our visit to coincide with Bastille Day celebrations. 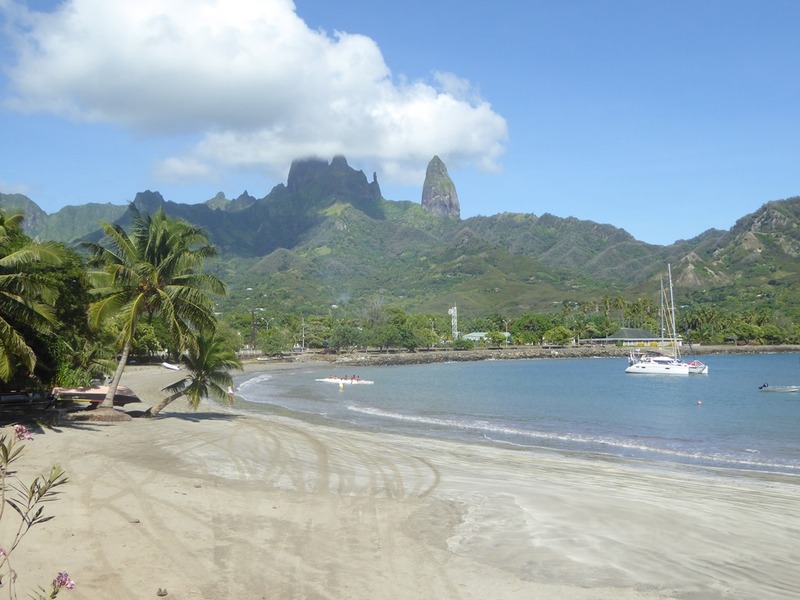 Unfortunately with the UK euro vote and its effect on the US Dollar which the French Polynesian currency to tied to, we have returned to civilisation after our lovely time at Tahuata to find everything is now 15% more expensive than it was a month ago. Bugger. Well done, Middle England. It was a bit of a blast back through the acceleration zone that is between Tahuata and Hiva Oa but we timed it just about right. We had a slow passage but in flat water as we went through at the tail end of the tide. 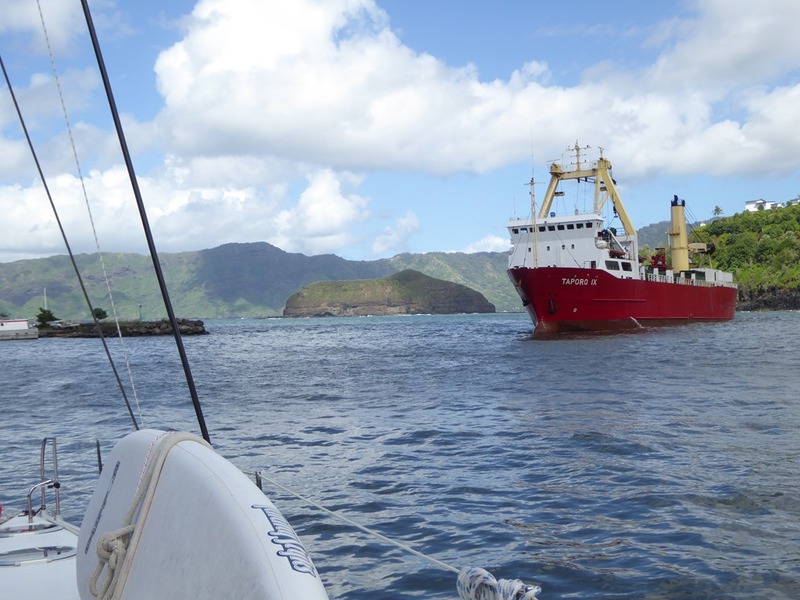 We arrived at Atuana to find some boats we recognised, most importantly Mary Ann II, who we had last seen a couple of months ago in the Galapagos. We had a quiet night with John, Julia and Murphy catching up with the gossip and to congratulate John in the completion of his circumnavigation whilst he was on route to the Marquesas. An achievement I’d love to emulate one day. Once we went in to check up on what activities were planned, we got a bit of a surprise. We seem to have landed in the Polynesian equivalent of Scotland. 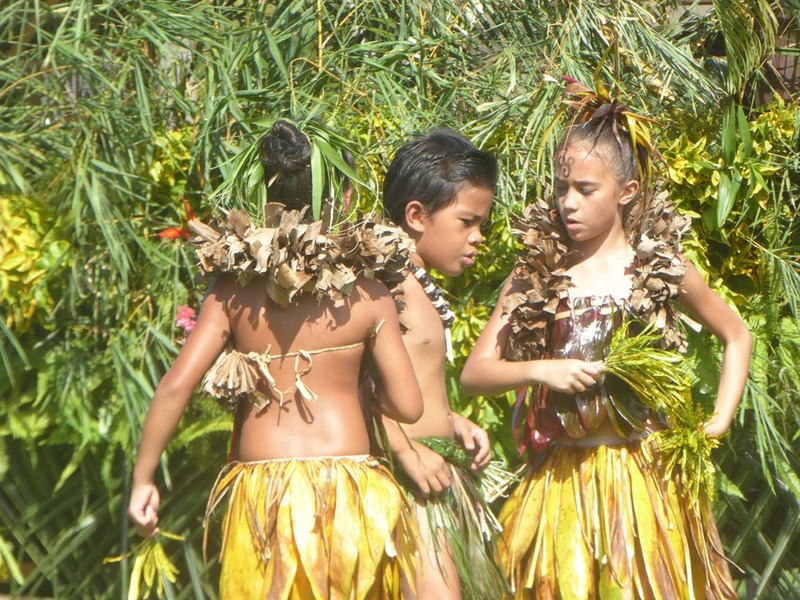 French “occupation” of the Marquesas is a subject that is growing in importance to the islanders. 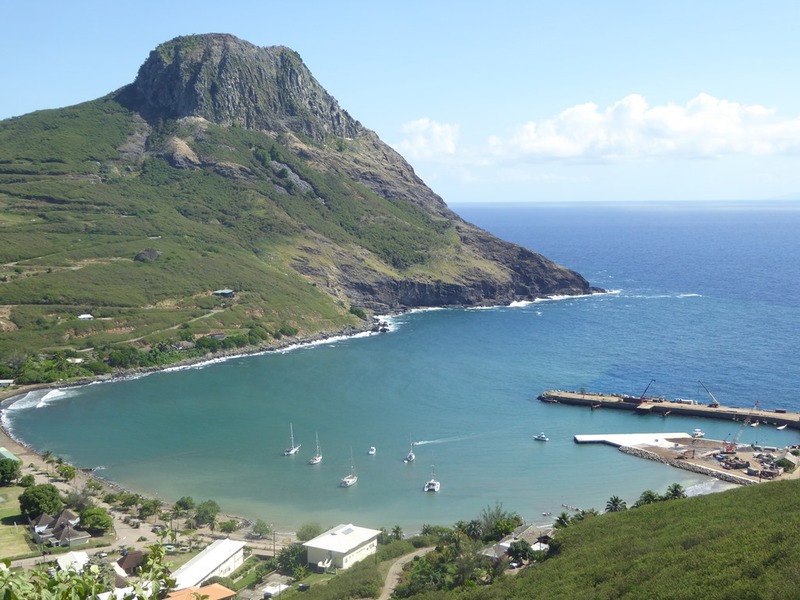 Since the French restarted nuclear tests briefly in the 1990’s, there has been a growing dissatisfaction with the perceived offhand approach to control of the island groups. 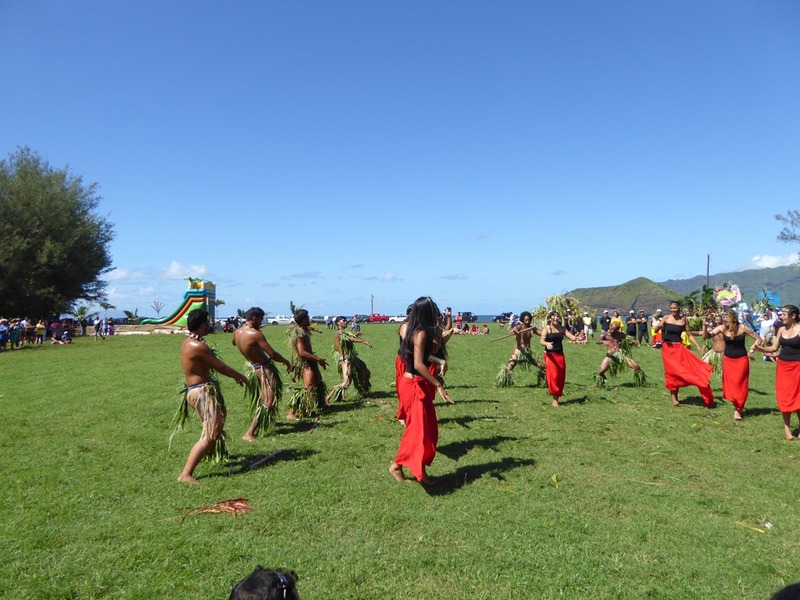 When the tests restarted without consultation, ordered by Jacque Chirac, the Polynesians rioted. The period is best remembered for the troubles on Tahiti but there was trouble on a lot of the islands and a nationalistic sentiment has been maintained here. Although the French eventually backed down, mainly due to the international condemnation of what they were doing, the damage, locally, was done. 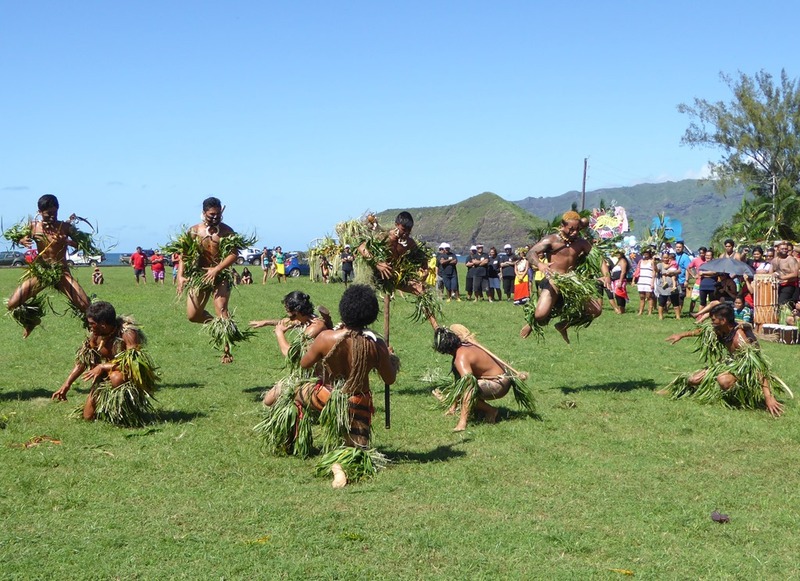 Whilst most islands do celebrate “Bastille Day” (Fatu Hiva, 35 miles to the S, parties for three days), here on Hiva Oa, they have decided they don’t want to anymore. What they have done this year is have a nationalistic parade to celebrate Marquesian culture a week before 14 Jul, a gala day with no reference to anything historically French on the day (no National Anthem and definitely no French flags) and then another kids parade, a week or so later. There seems to be a large proportion of the population here wanting full independence. 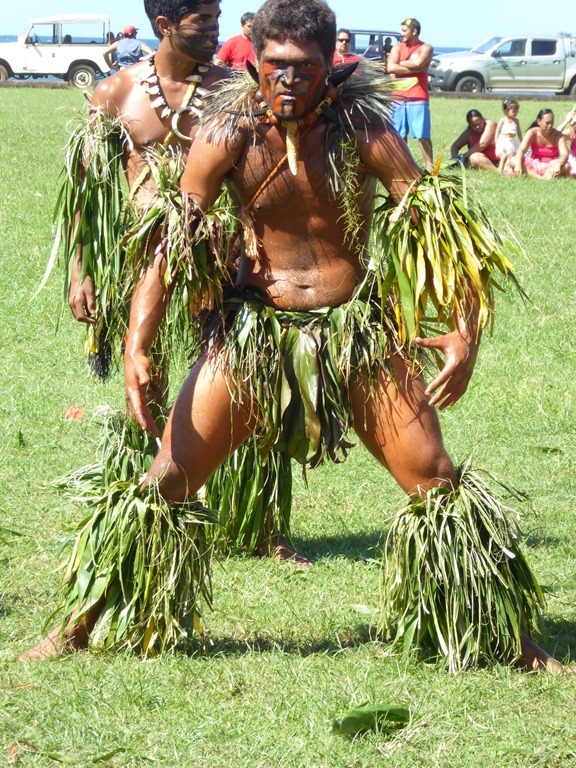 The dancing was great with teams from several nearby villages joining in the fun. Once the dancing finished and the prizes were handed out, the Mayor tried to hold court with the normal politicians “I love the sound of my own voice” chat but the experienced crowd was already moving towards the food tents. I suspect a lot of locals had been attracted to the day’s activities by the promise of free food and drinks which there were in great abundance! We got stuck in too. 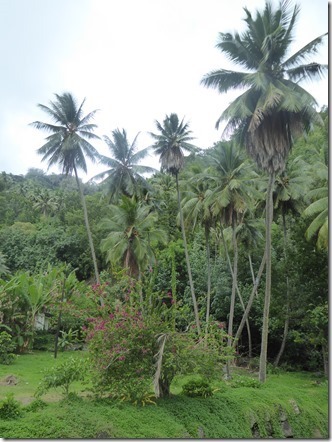 We attacked the supermarket here to stock up on essentials and some nice to haves to carry with us into the Tuamotus. 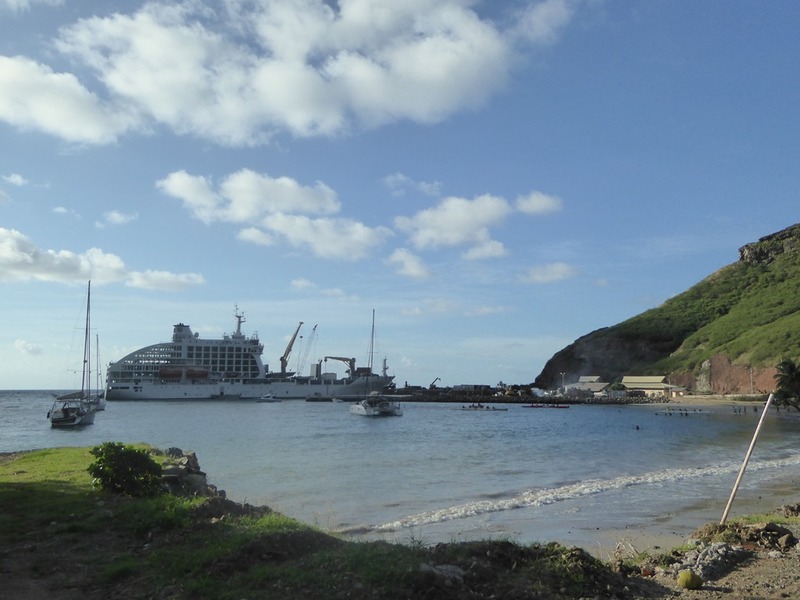 We lucked out as well as both the Airenui (the half container ship, half cruise liner we saw in Ua Poa – see that blog entry for a photo) and the normal delivery ship, the Taporo IX, have called in the last week, meaning for once the island is very well stocked. 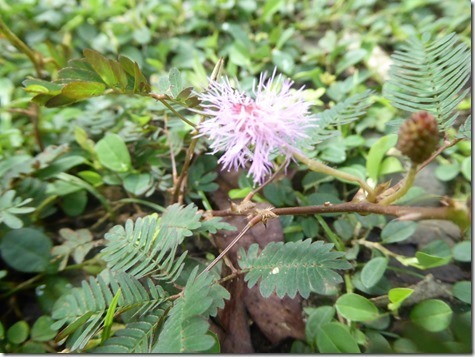 We shared the cost of a big 4×4 (10000XFP a day) with John and Julie and went exploring. 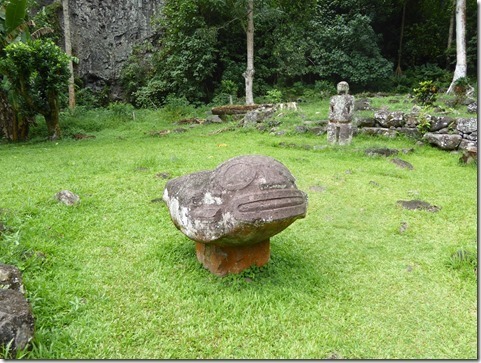 We decided to visit the NE corner of the island where one of the best preserved archaeological sites is. The drive up was long. Only 30 miles but it took over 2 hrs. The roads are rough but reasonably maintained and the time taken was more in caution of their steepness! 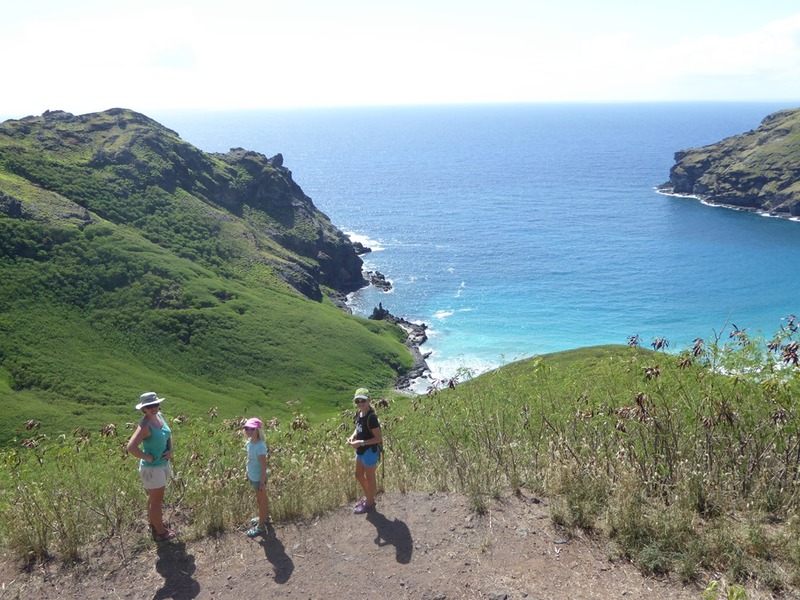 We stopped at various points to take in the glorious views as we climbed up and over the spine of hills running across the island, separating the N and S coasts. Once you get above 1500’, you have a noticeable change of vegetation with large fir trees predominant. The various views seen here are all looking N. Note, Dad, your hat is still waiting for your return. H says she didn’t think you would mind her borrowing it for the day. I think that the windswept headland in the panoramic is a crazy place for a hen run but there seemed to be plenty of birds around! 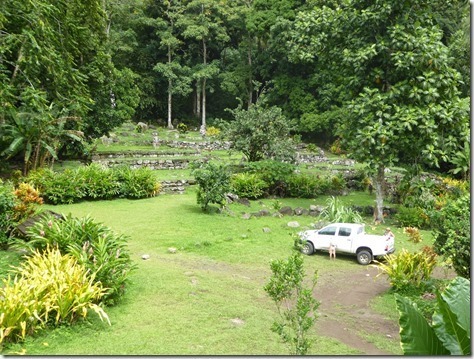 Although we intended to spend just a day at Tahuata after travelling S from Ua Poa, the weather suggested we stay on. The water was clear as a bell, a light wind blew and there was little swell. It just looked too good to go! 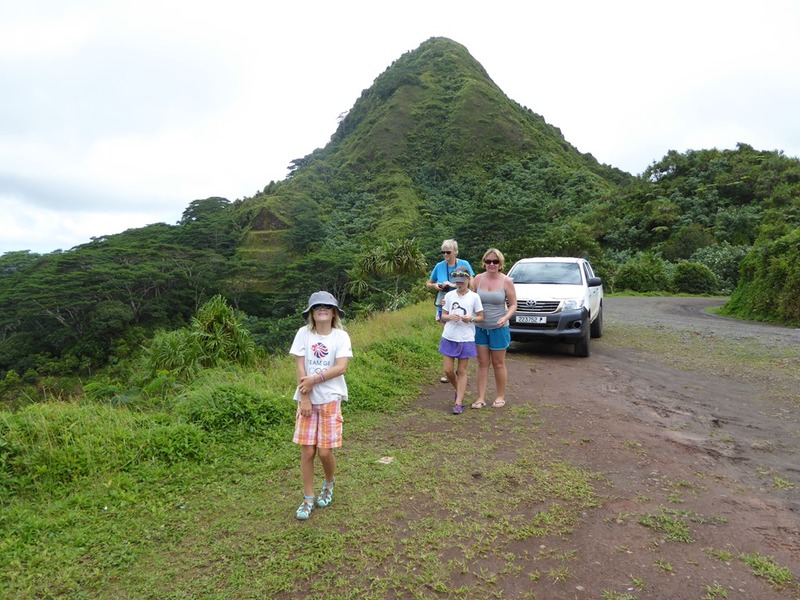 After a longer discussion, we also came to the conclusion that we wanted to slow down again and spend Bastille Day in Hiva Oa where the largest population would be. Tahuata seemed to be the perfect place to hang out for a while to wait for the big event. 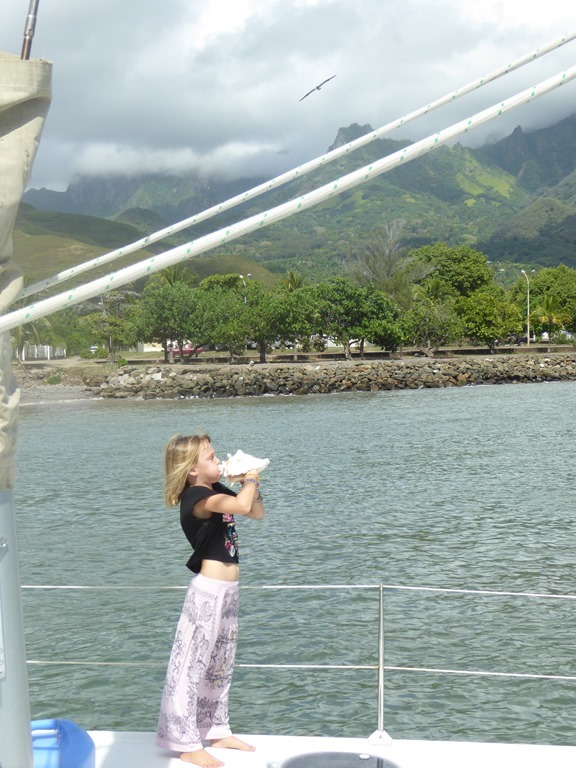 We had initially had three days in Hanamoenoa Bay. We got some practising with the spinning rod. We have a killer lure on it at the moment that works very well so we have been catching and releasing as the bay has ciguatera in it and we are unsure which fish are safe. 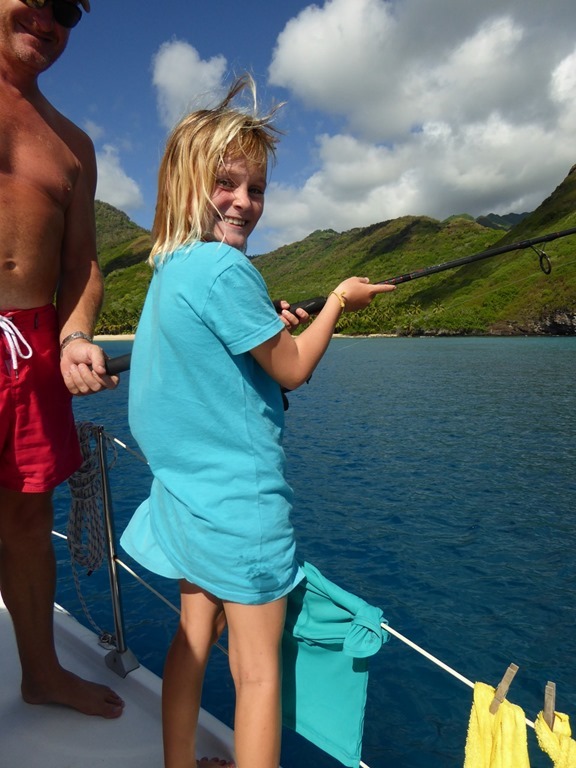 Much to her surprise, Hannah caught a 10ld Blue Fin Trevally which had her fighting hard and yelling for help. Perhaps not quite the monster of Death and Glory’s fame but still a cracker and the rod was impressively bent! We also were lucky enough to meet some very good people. ZigZag and Aislado came in and they had kids! Irena and Georg, Mia and Noah are on ZigZag and are from Germany. The kids are small. 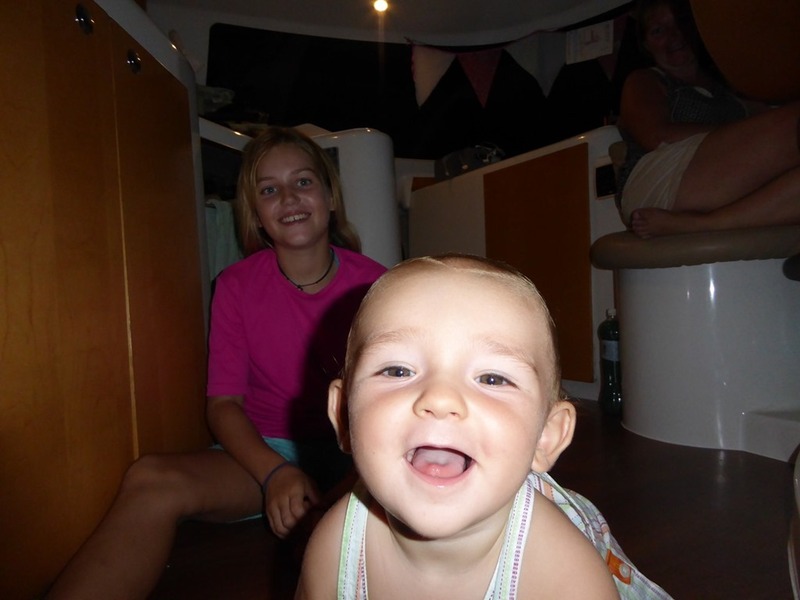 Mia is 3 and Noah is 10mths but the grown ups have been living on a boat for the last eight years and crossed the Atlantic for the first time 12 years ago on their first boat. 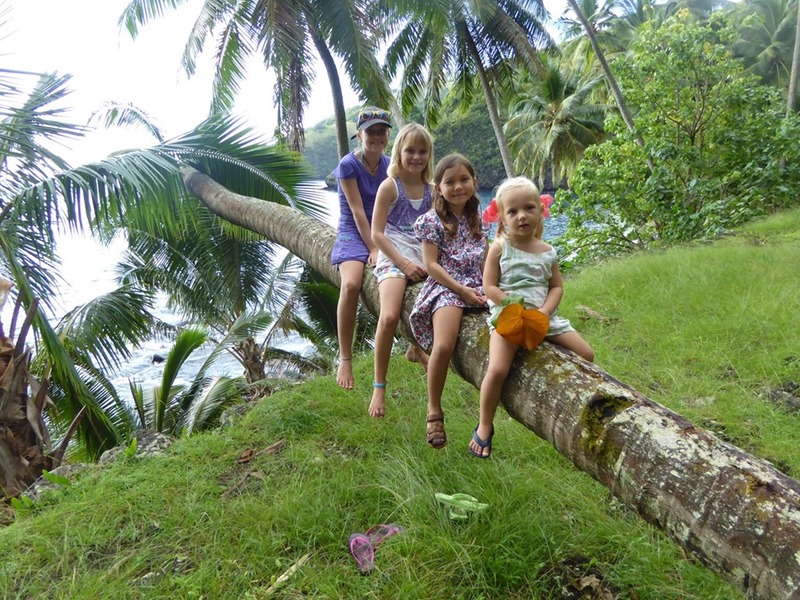 Vaughn, Silvia and their five year old, Zara are from New Zealand and Bulgaria respectively and are heading back to New Zealand. They also have Yana, a student taking a year out from her Theology degree at Heidelberg on board as crew. We cemented friendship with perhaps a touch too much rum and made some sort of agreement to look at business opportunities together (yup – a very, very, good night!). In the meantime, I was able to offer some advice on Vaughn’s HF noise issue and he was able to help plumb in my AIS multiplexer. It nearly works – just need to get a small resistor into the circuit and the damn thing should fly. The help was greatly appreciated as those who know me will realise how much I dislike electronics! I think both boats are going to be going a little faster than us to NZ and we are going to have limited time with them but I am really looking forward to meeting up with them once we get down there. 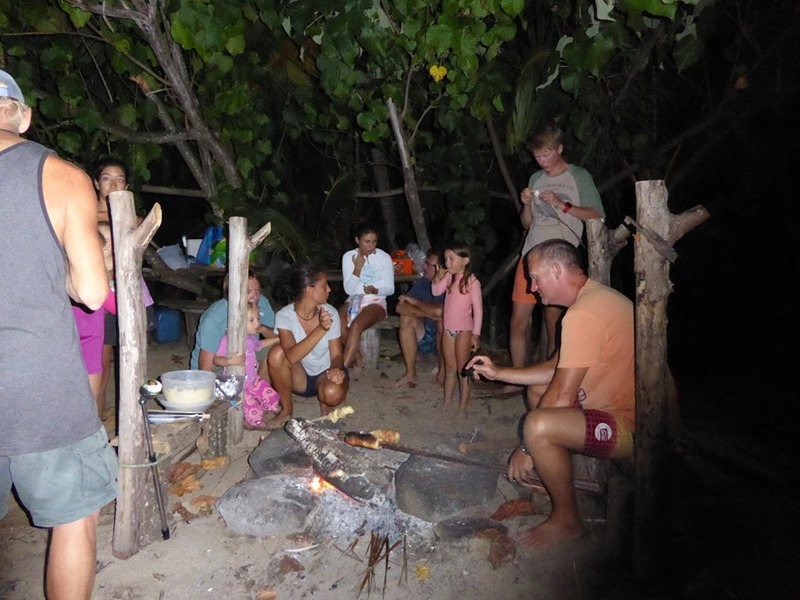 It was really nice to be in kids’ company again and Irene got everyone in the bay ashore for a BBQ and marshmallows. The kids loved it and the older adults (this is Debbie from Kalliope with Noah) spoilt themselves having fun with the v smalls. Sadly we now are marshmallow-less. Next visitor to Skylark from Europe take note. There will be a request for resupply! Next best thing after marshmallows is making bread on sticks over the embers. Perhaps not quite the sugar rush the kids’ hope for but still very satisfying. Our thanks to ZigZag for showing us the trick. 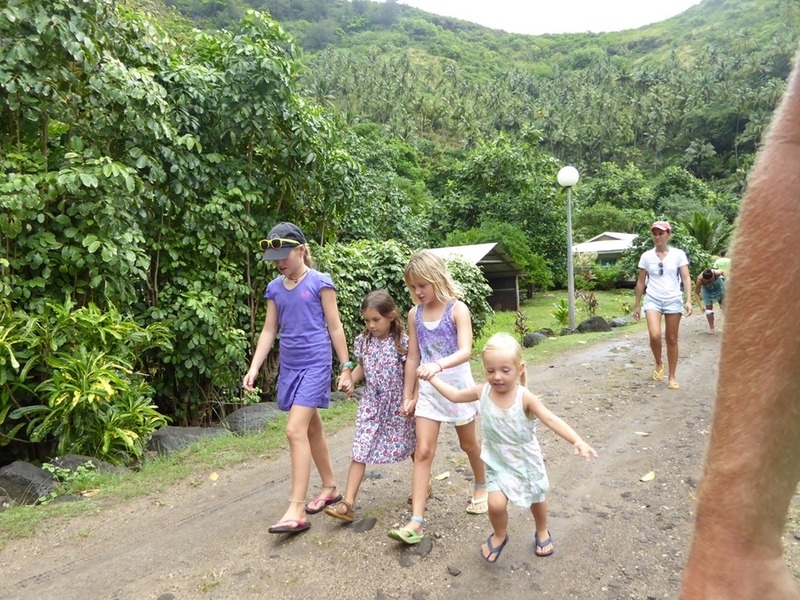 We moved down the coast to Hanatefau Bay and the village in the bay 800m S, Hapatoni. The anchorage is small but has good holding on sand. Watch for coral heads, the mantas and white tips here. The snorkelling has an excellent reputation but it is deep. The village has a good dock but it can be subject to swell. We put a stern anchor out to keep us off the wall. The locals are very friendly. It started with the kids playing by the dock, happy to chat, allowing the baby to kick the football and then offering us shelter as the torrential rain started. Just decent, happy, down to earth kids. We walked through the village and followed the very old walkway, built with huge stones with traditional raised housing platforms lining it, these days boasting modern housing. Every villager we went past had a smile and a welcome for us. I wasn’t able to find out how old the village is but it must be considerable. 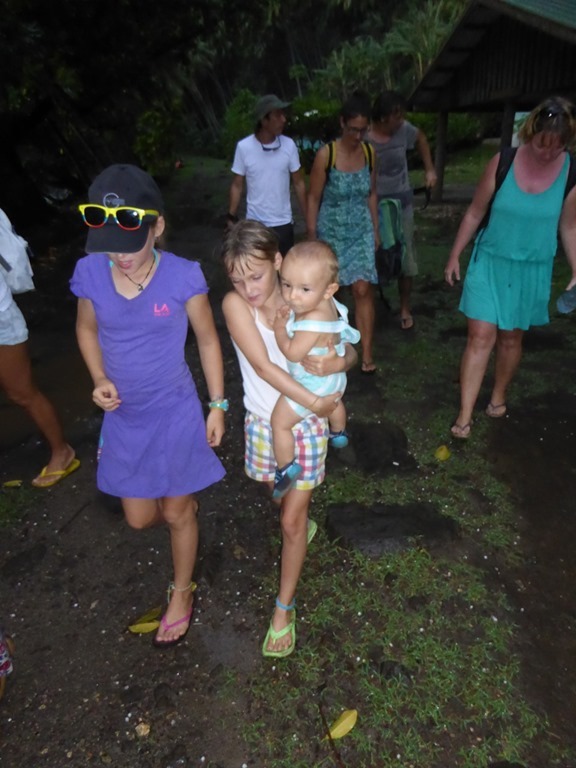 Whilst we explored, it was strange to watch Eleanor and Hannah carrying out the duties of big kids for Mia and Zara. They both did well. We also found a selection of animals. 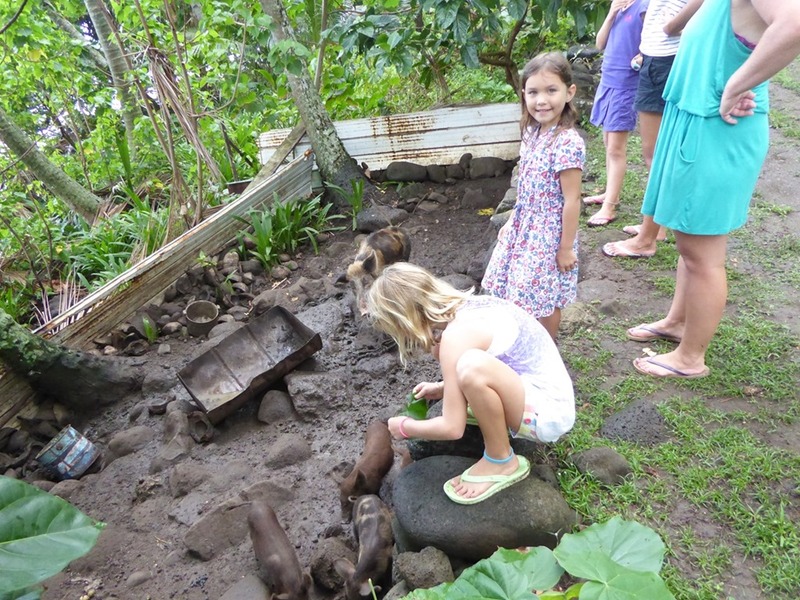 Two pig pens allowed the smalls to coo and throw greenery at the animals. The Noah related baby carrying was becoming mercilessly competitive between H and E to the point that Dad stepped in and had some fun himself. You forget how small they were! 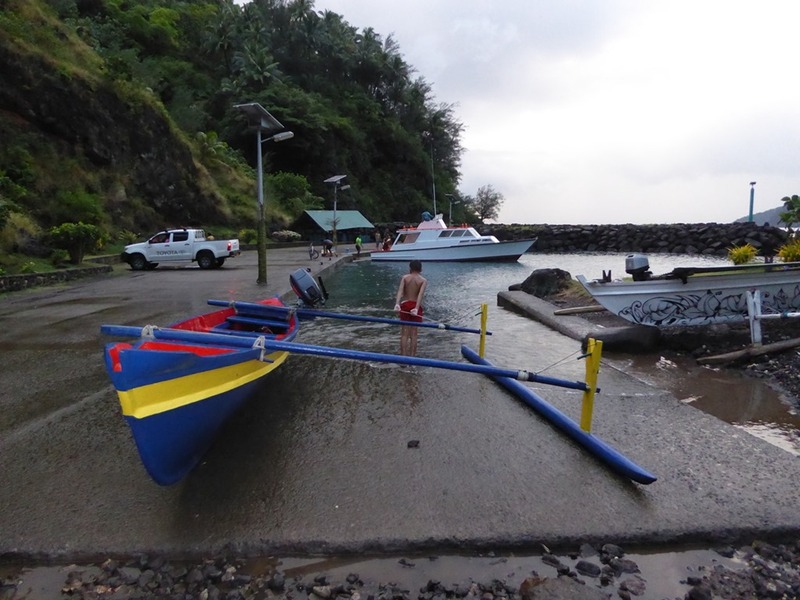 When we came back down to the harbour to head back out to the boats, we met the small delivery boat bringing some supplies and shopping in to the village from Hiva Oa. There were a couple of sacks of baguettes and we asked if it was possible to buy a loaf per boat. The lady in charge with a big smile on her face, decided that with kids we needed at least two loafs each and no, the villagers wouldn’t accept payment. Thankfully she bent enough to take a small gift bag that Irene on ZigZag offered her to make us feel we were not freeloading. Just plain goodhearted, friendly and kind. For future visitors wanting to trade for fruit and veg with the bloke that lives on the edge of the anchorage, old ropes for the horses, kids’ shoes and batteries were what he was asking for. I believe the village also has a small craft stall which can be opened up for visitors but we didn’t find it. 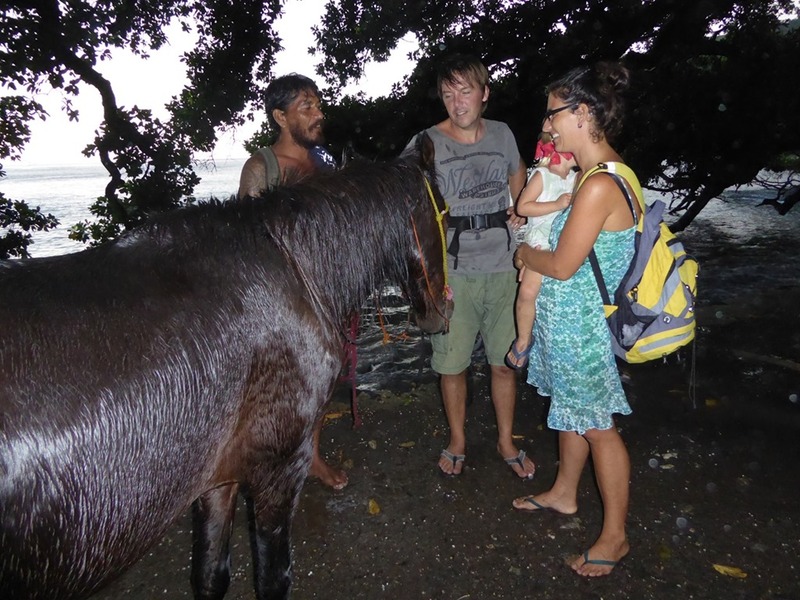 After a night’s discussion, we were invited to join ZigZag and Ailsado who were heading down to Fatu Hiva. Although it was a complete change of our plans, the breaking strain of a KitKat was applied and we accepted the kind offer. We headed out with less than perfect weather but with hopes that the wind would both ease and move a little into the N as forecast. Unfortunately neither happened. The W side of the island is in the lee of the spine of hills running down the island. The occasional break in these means small acceleration zones where from 0 to 30+kts is a matter of yards. Stay a mile offshore! 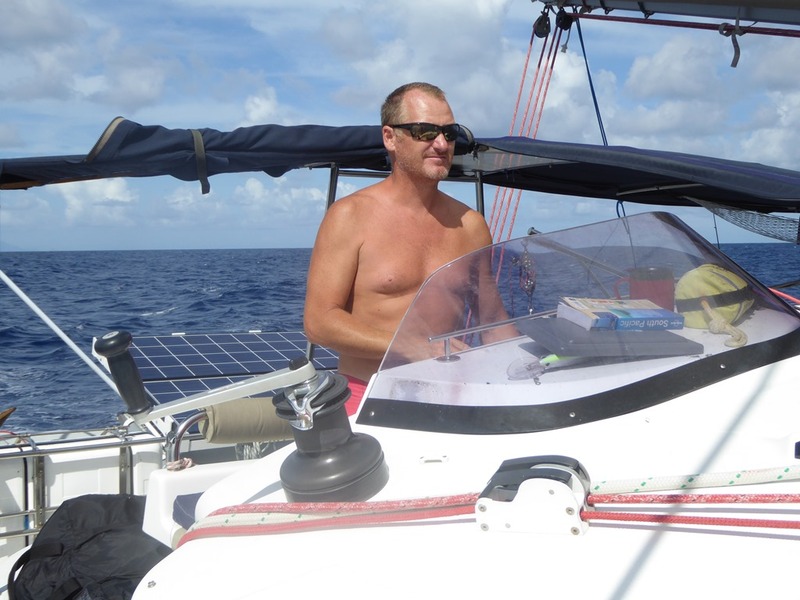 We cleared the S end of the island with 30+kts showing and a 40 mile beat into 2.5m waves in front of us. 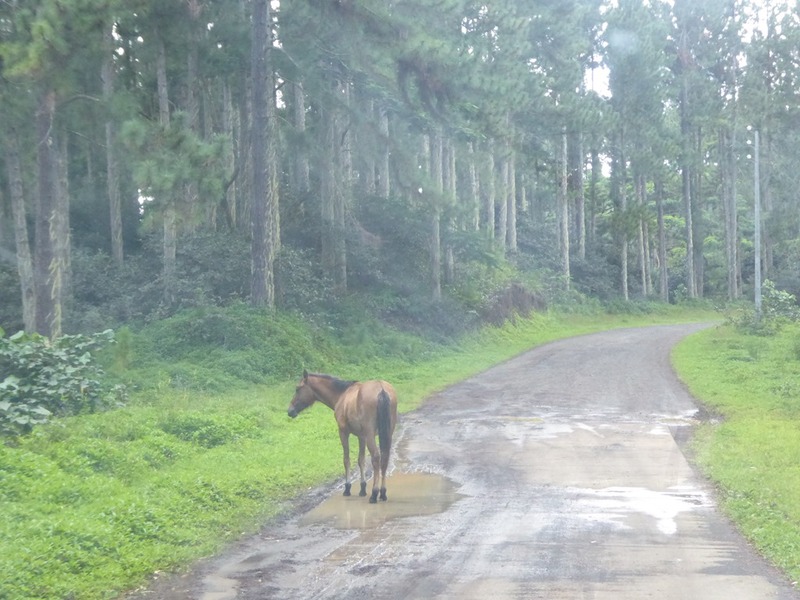 We quickly decided that we would turn back to Tahuata. The French Lagoon that went past us heading on a far nicer course to the Toamotus was bouncing. Vaughn on Aislado, his stately HR 46, three times our weight, long keeled and with a far better upwind capability decided to continue but still got a bit airborne as they passed us heading back in. They had an interesting sail and anchored in the dark at the Bay of Virgins. It took them four attempts so as much as I’d love to have had their company for more time, I don’t have any trouble in saying we made the right choice in chickening out. Rather than staying at the S end of the island, we headed back up to the sand of Hanamoenoa Bay to meet up with ZigZag who had also decided discretion was the better part of valour. It chucked it down and squalled for the rest of the day. We made up with it with a visit to ZigZag for “kaffee unt kuchen” to celebrate Noah’s fourth tooth and then a return visit to us in the evening. Noah is the youngest visitor we have had and is on the verge of walking. We hoped he might achieve this milestone on the flat of Skylark but it wasn’t to be. He made up for it by being cute. 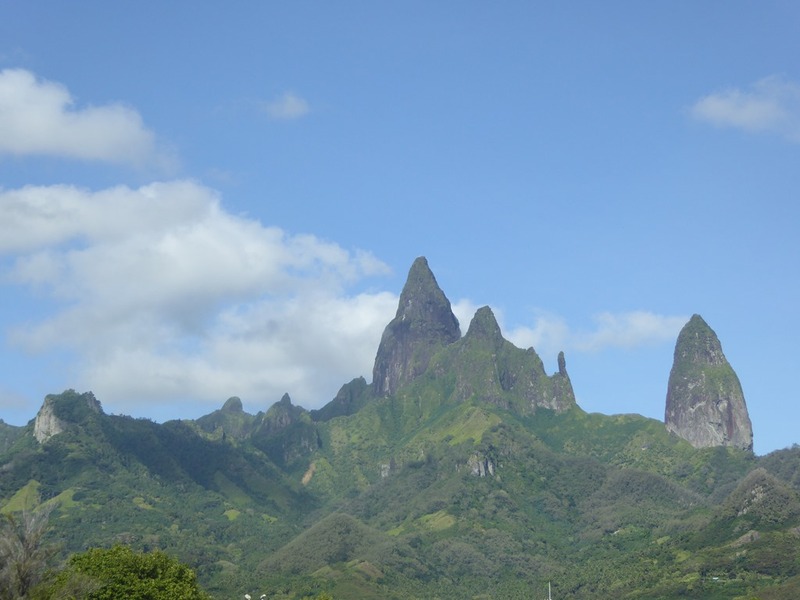 Having decided to go back to our original plan of hanging around Tahuato until closer to Bastille Day and then going up to Hiva Oa, we said our goodbyes to ZigZag the next morning as they headed out for another go at reaching Fatu Hiva. 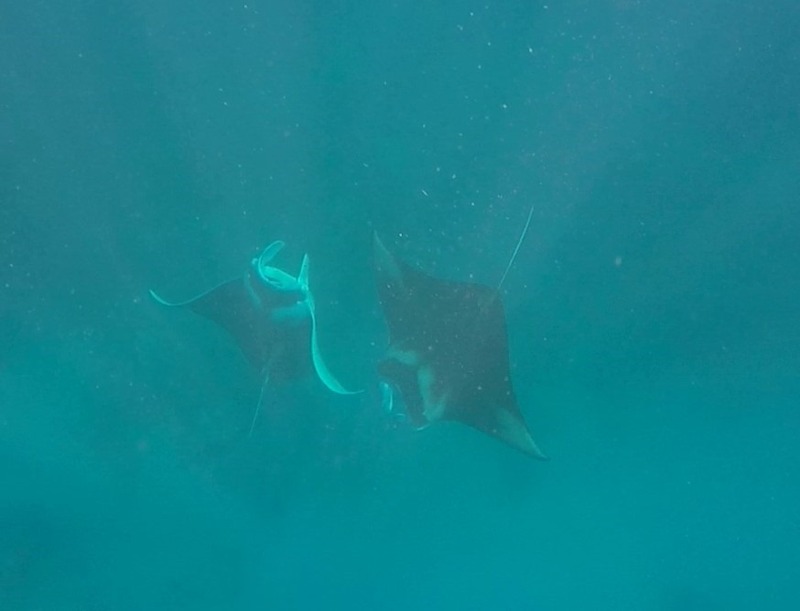 We made up with the disappointment of not going with them with the visit of three manta rays about 8-10’ across, feeding just behind us. Their slow grace was wonderful to watch as they summersaulted, corralling the plankton they were feeding on. 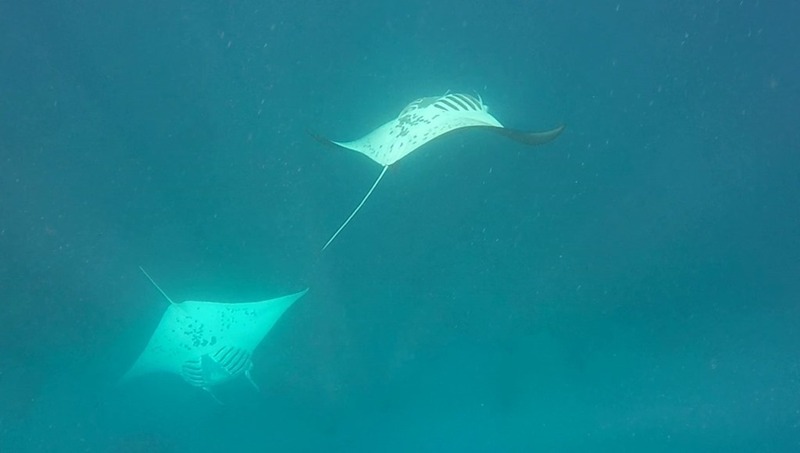 We swam with them for half an hour and got some great video and photos. We lucked out with the arrival of another French boat, Toomai, with two boys of 15 and 9, and spent another three days enjoying their company. We also had Sequoia, an Open 40 lookalike, with Jean and Tiph on board. I asked Jean how quick Sequoia was and gulped when he said he had hit 25kts in her! The French boats spearfished and after clearing the fish with one of the local boats that went past the bay, ate the product. They did throw away at least two fish that the locals thought would be infected with ciguatera. I’d suggest that you make damn sure you do check with locals on anything you catch as it seems that the advice on what are safe fish varies bay to bay. After school, the kids played, paddling their way around the bay from boat to boat, the adults circulating, enjoying each others company and just watching the world revolve. Our thanks to Antoine for showing the girls how to make caramel popcorn with just brown sugar. Not sure if our pots will survive it but it tastes very good! We had one last night of brownies and coffee watching the sun go down before we all headed our separate ways before the weather broke. 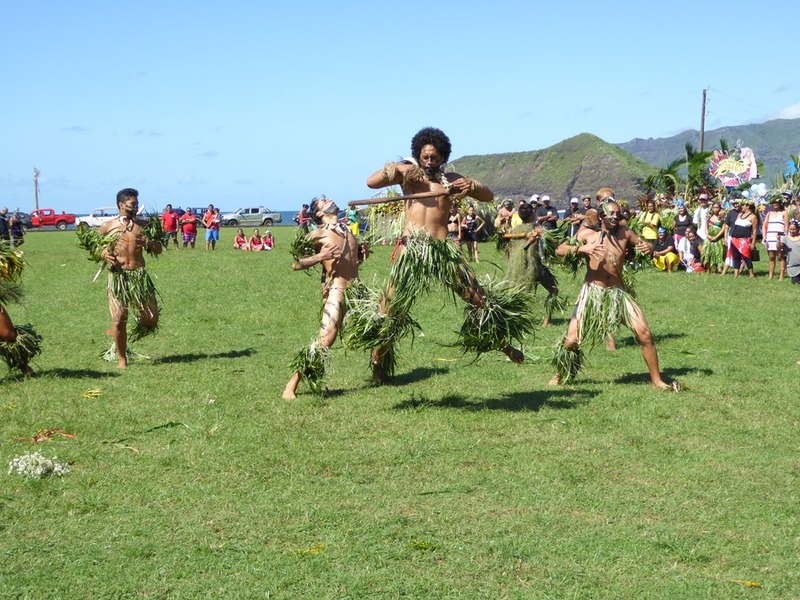 Toomai left for Fatu Hiva. 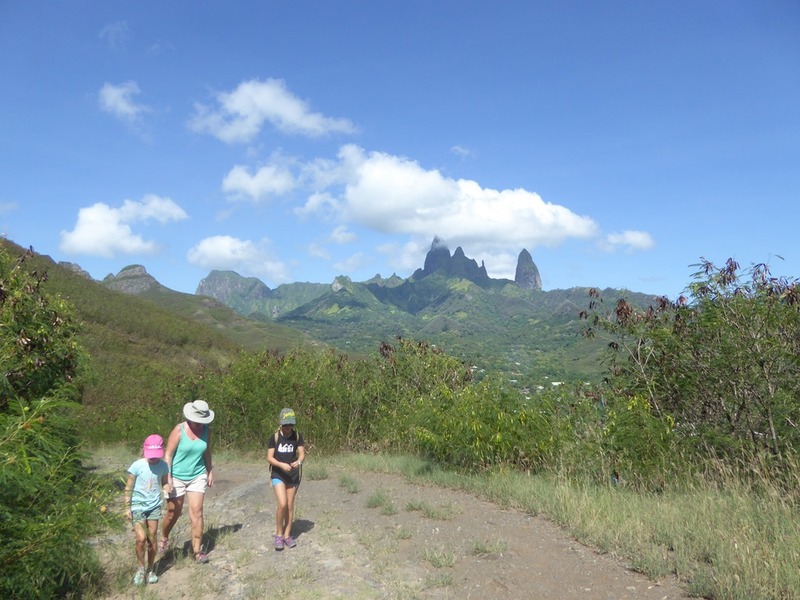 Sequoia with Jean and Tiphaine headed N for Nuka Hiva and we headed for Hiva Oa. It was a good way to sign off on Tahuata. We left the bay empty, awaiting the next yachts looking for their own little bit of paradise. 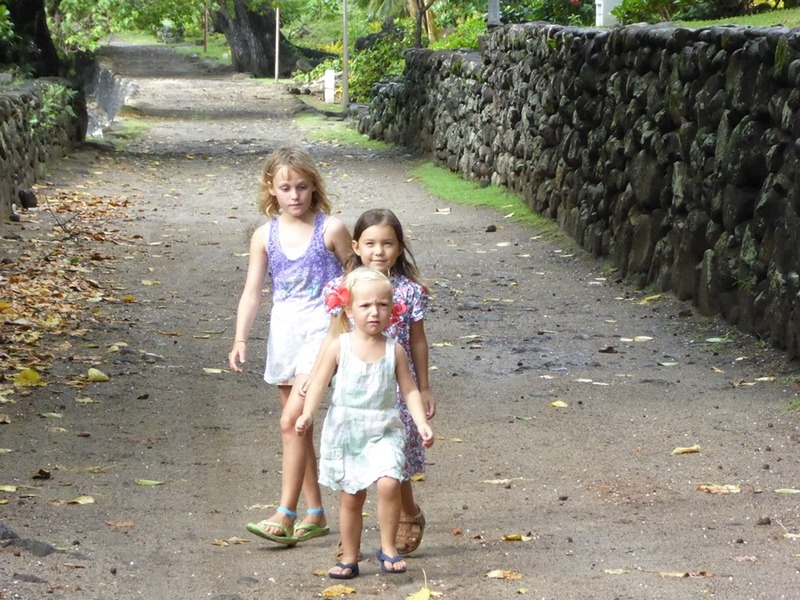 I was unsure to the point of rudeness about Hanamoenoa Bay on our first time visiting the island. I was prejudiced due to the big swell we had which made it both a rolly anchorage and difficult to get on to the beach. I should like to make up for it now and say I can see why, all those years ago, the Hitchcocks enjoyed it so much. We saw its best on this visit and it was spectacular. A great island for kicking back and enjoying the simple life. I doubt you will recognise the name of the island. 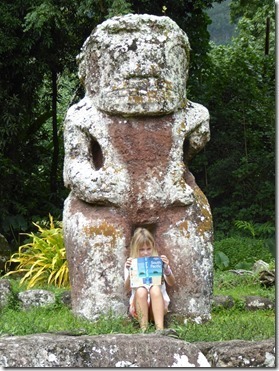 But I bet you have seen one of the classic Polynesian images to come from here. The 4000’ spires of this island are famous and often to be seen on promotional literature, extolling the beauty of the region. Although they are often clouded over, when it does go clear, they are spectacular. 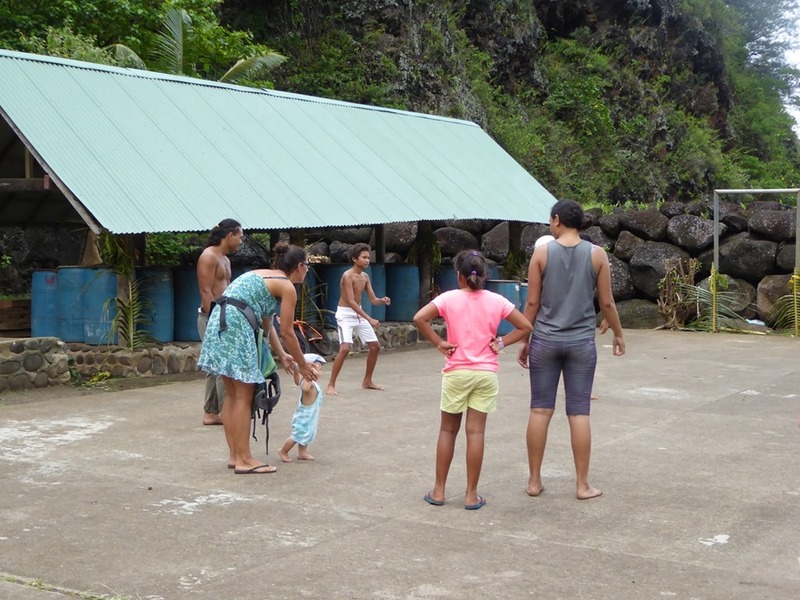 We arrived at Hakahau, Ua Pao, the main village of the island after a slow but comfortable night sail from Hiva Oa. We had a little trouble with a suicidal parasail sheet overnight which necessitated a swim to untangle it from the stb propeller which it had wrapped itself around. Not much fun in 6’ of waves but quickly done. 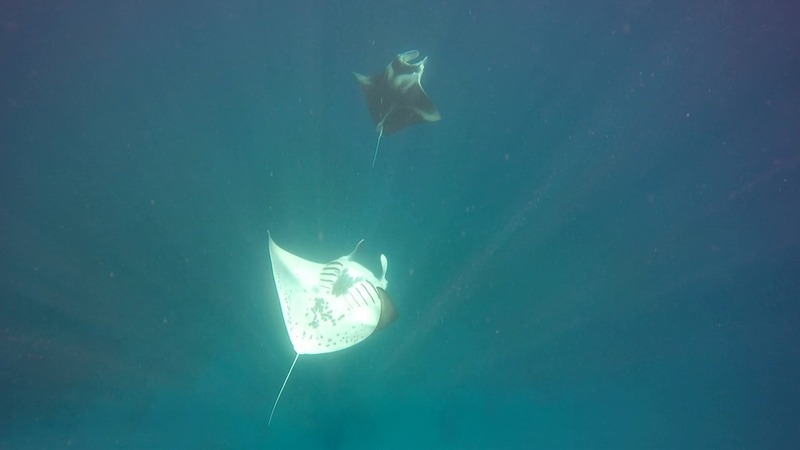 We anchored on the inside of our friends Wolfgang and Kathi on Plastik Plankton, in very little water. Bar Isabela, this is the most protected and flattest anchorage we have seen for a while, with both a big breakwater and a brand new dock giving yachts lots of protection. It helps that it faces N, traditionally where little swell ever comes. We arrived to find this strange ship in. It is a mix of cruise ship with cabins at the aft with container space to allow it to deliver goods to the islands. The tourists from it, all looking white and unhealthily blotchy or lobster like, are wandering around, mobbing the number of locals. The ship will depart tomorrow so we will have peace. There is a excellent, very clean sandy beach with no surf to pull the dinghy up on. Don’t bother putting your engine on. 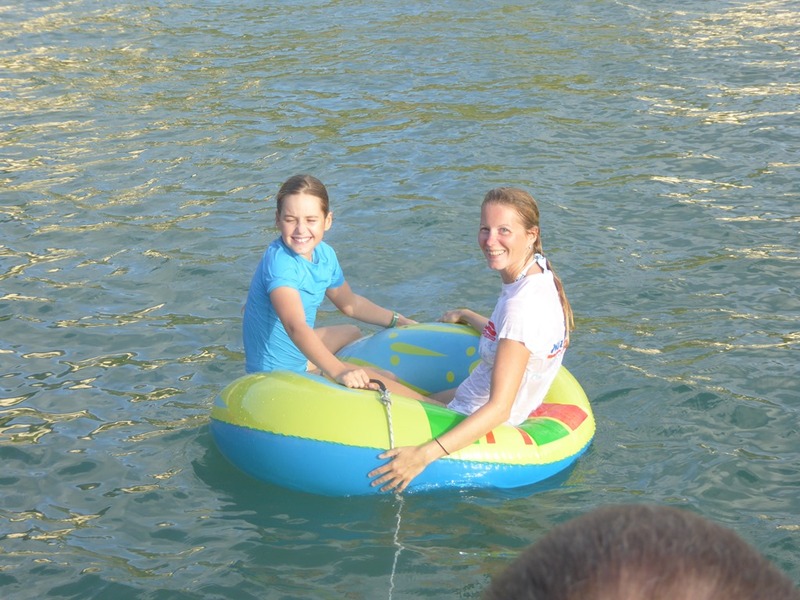 It is an easy row and you will need to lift your dinghy a long way up the beach to get it to the high water mark. The beach is well used by the locals. Fishing before first light, outriggers training finished by 0700hrs and then a variety of kids appear over the course of the day as the school has its own boat house on it. 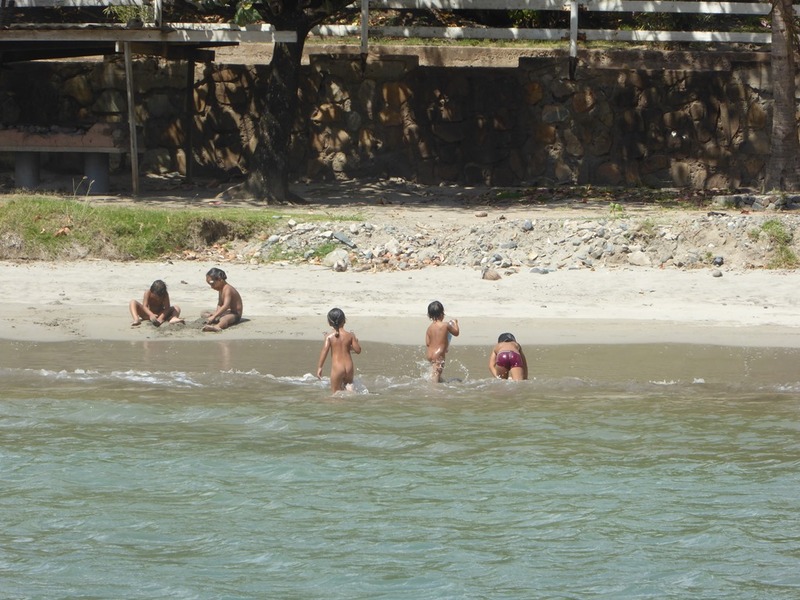 They do swimming, canoeing, running and occasionally horse riding on the beach. Lots of fun and laughter and a great excuse to ditch clothes! The day starts early here. The bakery, a pink building 200m past the school boarding house runs out of bread by 0800hrs. Bread is even cheaper here than Hiva Oa at 54XPF a loaf (about 35p). However they also do croissants and pain au chocolat here (120XPF each) which we haven’t seen elsewhere. Oh to eat a civilised breakfast! We were surprised by the supermarket as well. A good range of stock if limited in variety. Above the anchorage to the E, there is a hill with a cross at the top. 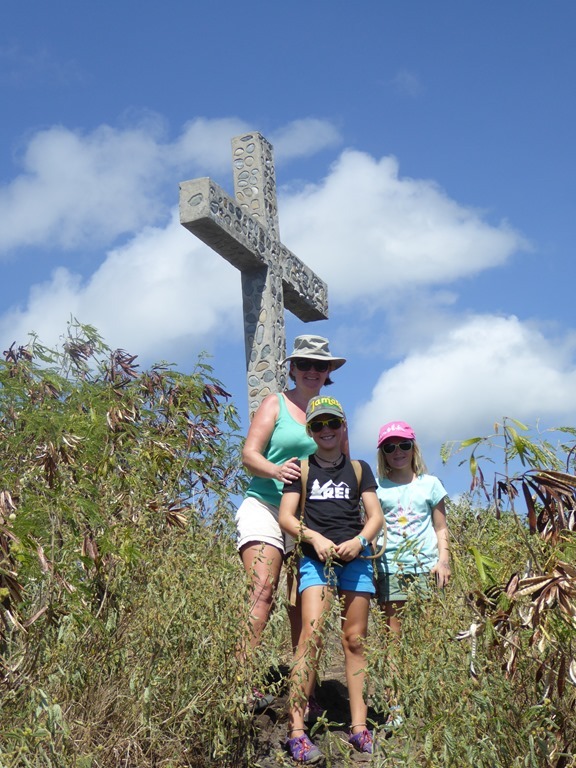 We had heard that the walk up was worth the effort so filled the camelbak and headed off. We were slightly delayed when Hannah found a lamb crying to itself. A bit of petting was in order. After a little bit of aimless wandering requiring directions from a couple of locals, we found the road going up to the “power station”, a white building with a generator in it behind the beach which led on to the track we needed to follow. The walk up was an easy gradient but hot. Make sure you take water. The walk didn’t take long, no more than 45 minutes and we were stopping to look at the ever more impressive views. The view back down into the bay was worth the effort. Skylark is the only catamaran in. There is plenty of room and the holding is good in firm sand. 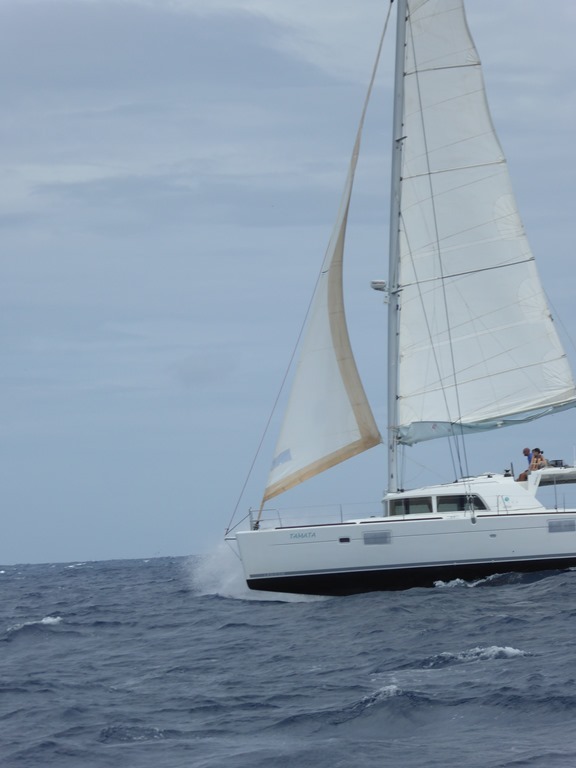 As an aside, we have noticed a big drop off in the number of catamarans. Monohulls are definitely the more numerous which is a big change from the Caribbean. 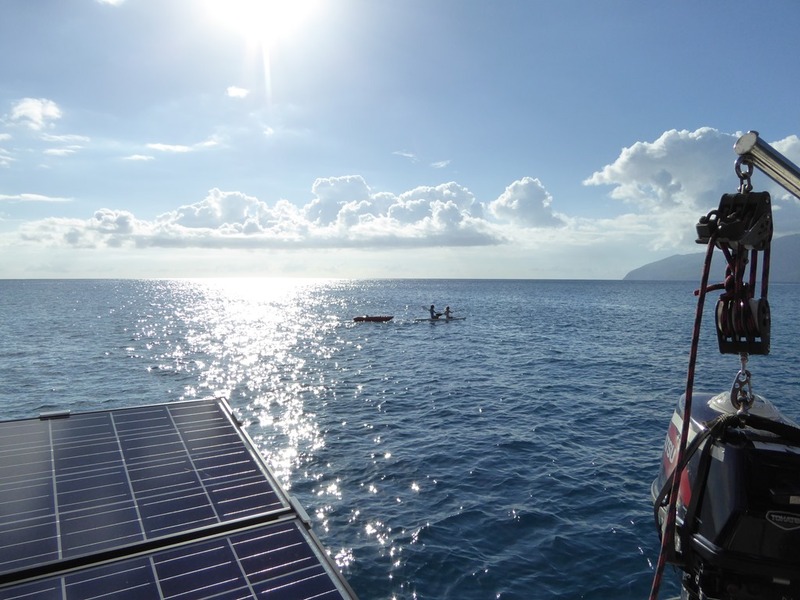 Most yachts are very well provided with solar, wind and those little touches that mark out a long distance traveller. It does mean there is always space for the cheeky catamaran who can anchor in three feet less water than our mono friends! From the top, the panoramic proved spectacular. The village of Hakahau is well spread out. 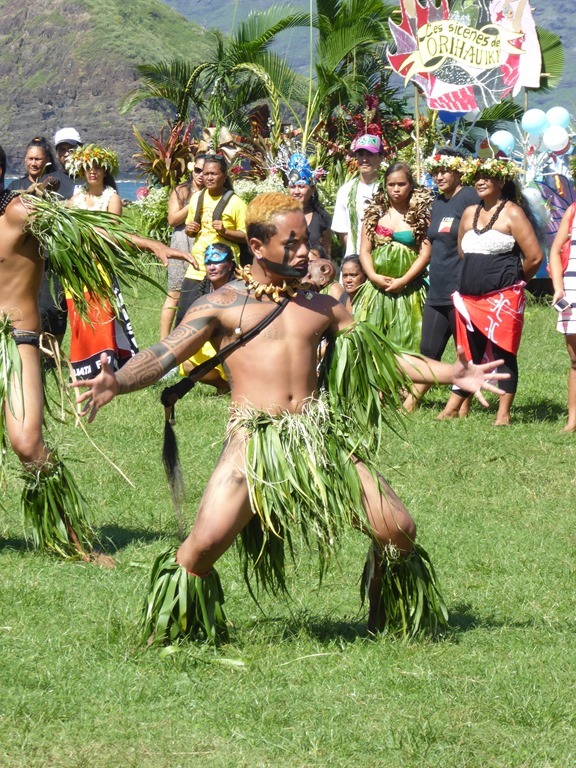 It is the third biggest in the Marquesas with a population of around 1000, most of the island’s people being centred here. Walking back down, we looked down into the next bay to the E. Completely deserted, it may require a day visit on our way back S as it has a reputation as an excellent surfing beach. It looks W and the swell comes straight in for much of the time. After we came back down, we finally managed to get a SIM card for the phone. A phone call later and we confirmed our winter haul out at Apataki in the Toamotus. 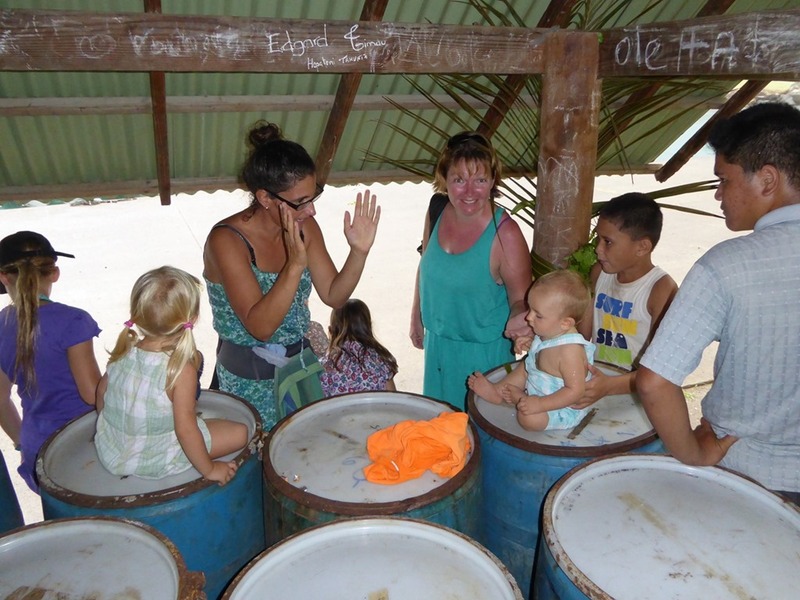 We have told them that we will arrive in November and stay to Mar, which covers us for the cyclone season. We will be looking at flights from Apataki to New Zealand and for the purchase of an RV once we get to decent internet land, a rare place here. Wolfgang and Kathi have decided that they will need to head off to the Toamotus tomorrow as the weather, good for the next few days, is going to turn very slack for a couple of weeks after that. They have been exploring the Marquesas for a month already and don’t want to get stuck here and lose the chance of more time in the Tuamotus. They have been getting their wind vane back into working order after it jammed on them. It was just blocked up with salt – a common event when sea spray dries so quickly in the heat here – and cured with a wash and clean. 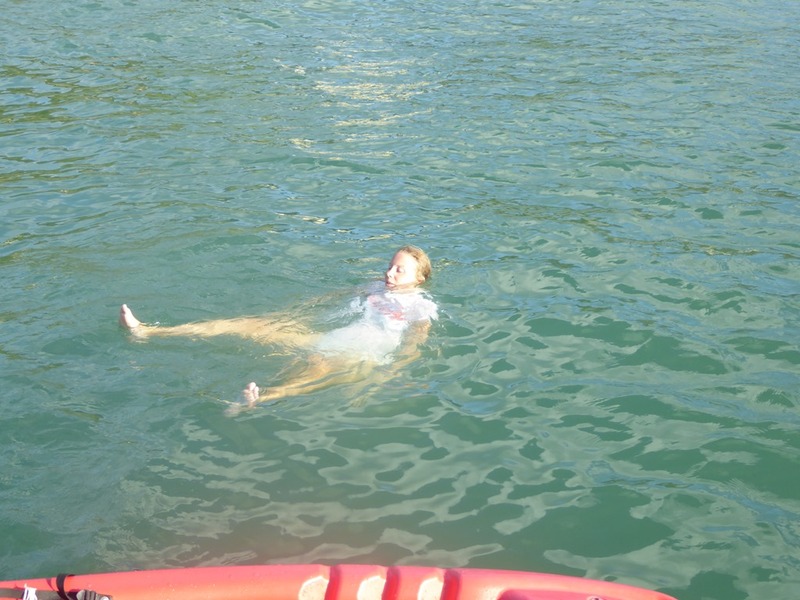 There was time for a bit of fun of the back of Skylark and Hannah conducted diving lessons for Kathi. She progressed from the bottom step to the front of Skylark impressively quickly. 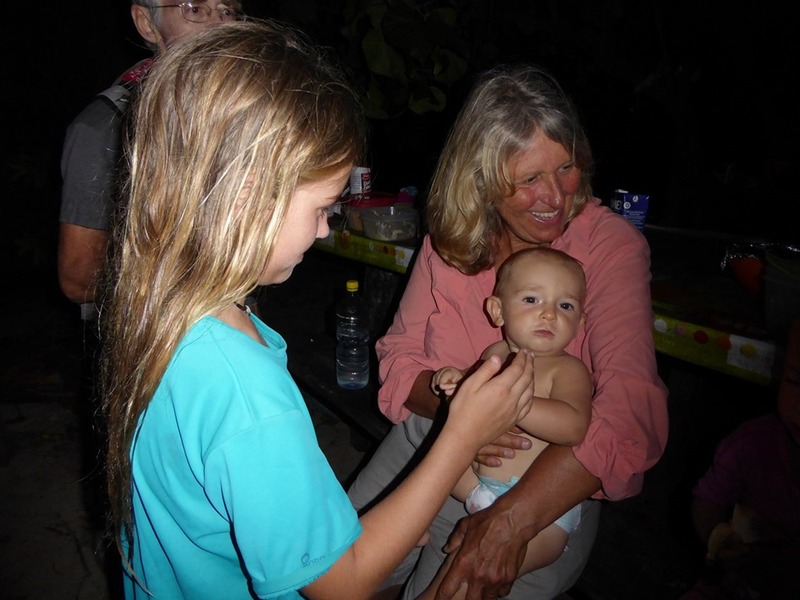 We enjoyed one last evening of sundowners with them too – painkillers were the theme of the night. We are hoping that we will catch up with them further down island. They are great fun and good company. Hannah conched them off, the traditional Caribbean farewell! 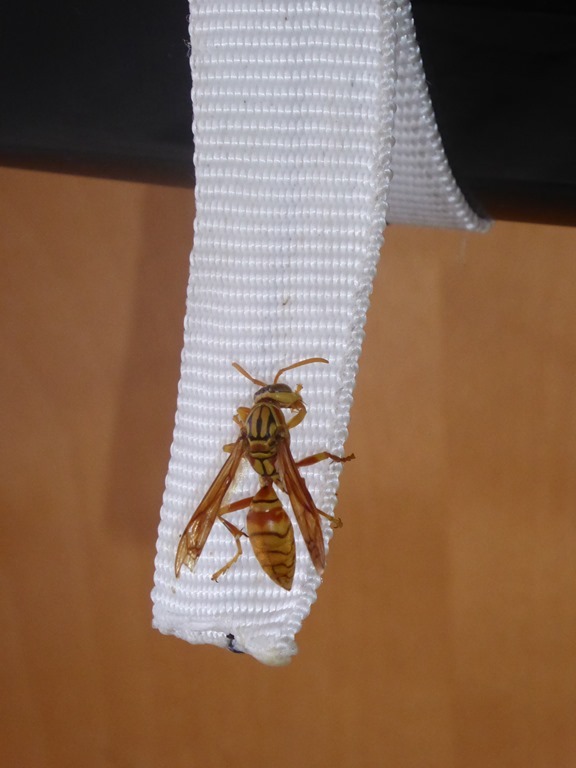 One of the less pleasant regular visitors we have are these enormous wasps. They are over an inch long and whilst they don’t seem to be aggressive, it is a little alarming to find one buzzing around your face. Thankfully, they don’t seem to mind being shooed out. 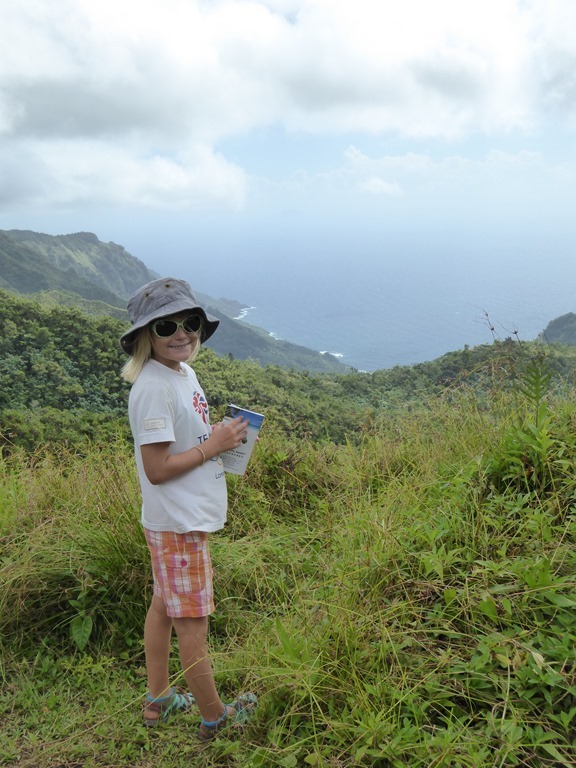 We have only just scratched the surface here but we need to move on quickly to meet Mia at Nuka Hiva, the next island N. We want to visit some of the anchorages on the W of the island, one of which has a great walk into a couple of waterfalls. We will return in a couple of weeks. 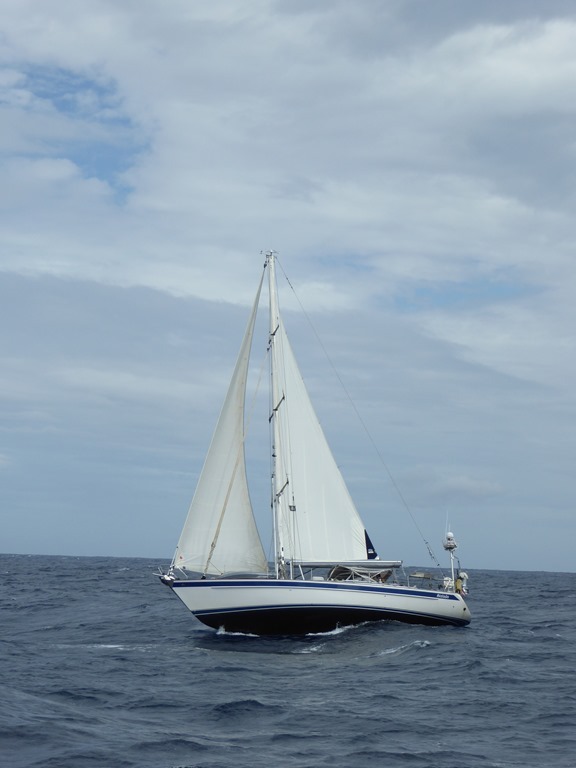 In the meantime, onwards N in 15kts of glorious SE trade wind!